We are proud to offer four luxurious guest bedrooms, each featuring private ensuite bathrooms. Each of the guestrooms at our bed and breakfast in Catskill, NY, are unique and carefully decorated with attention to detail and style. Beautiful antique furniture blends seamlessly with contemporary pieces to create rooms that reflect the rich sophistication of a bygone era, while providing the comfort a modern traveler expects. This spacious room features a California king bed with memory foam mattress, an en suite Carrera tile bathroom with Jacuzzi tub, and a large fireplace refitted with thermostatically controlled gas logs. Rate: $275 USD per night, includes welcome package, evening port, and full breakfast. The charming North Room features a Thomasville post bed with a queen memory-foam mattress. It has views of our tennis court, beyond that, Cedar Grove (the Thomas Cole national historic site), and the Catskill mountains through the trees. Rate: $260 USD per night, includes welcome package, evening port, and full breakfast. 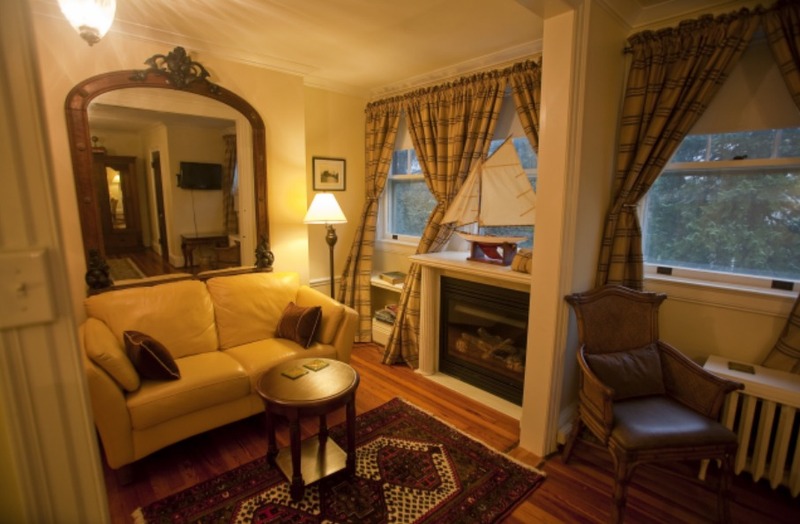 This is the largest of the rooms that our bed and breakfast in Catskill, NY, has to offer. It is furnished in the luxurious style of the late 19th century, with walnut carvings, rich marbles, and original artwork. Our “Captain’s Room” is the room to choose if you want an entry/sitting area. It also features a double Jacuzzi tub. The bedroom features a massive king-size bed with memory foam mattress. Sitting area has love seat by gas log fireplace flanked with marble columns. Rate: $305 USD per night, includes welcome package, evening port, and full breakfast.